Specially engineered to suit the all-new Nissan Qashqai, Car of the Year 2014. Our Viper BB005 Side Steps are the latest in Style for your Qashqai 2014 SUV 4x4. Our Stainless Steel Chrome Look Viper BB005 Styling Side Steps are Stunning! The finish is gorgeous hand polished mirror look stainless steel. Easy to fit with tough anodised brackets, This product requires 4 holes to be drilled on the lip of the sill and is supplied with all the fixing materials needed to fit the Nissan Side Styling accessory to the vehicle. Perfectly angled ends, rounded, a process that takes experience and skill. Our bars do NOT have cheap straight cut ends. These bars shout quality. Our 4x4 Side Bars, Rear Bars and Front Bars are Hand Polished to a chrome look mirror finish. We use only the Best European Quality 76mm Polished Stainless Steel Tubing from Italian Steel Mills. Our Tube has a massive 1.5mm wall thickness for great quality Protection Bars. The price includes a pair of Viper Side Steps with 4 Cut-out Plastic Steps for Qashqai J11 2014 on models, that fix to chassis frame mounting points. Easy mounting System - Requires 4 holes to be drilled on the lip of the sill. Excellent value for your Nissan Qashqai 4x4 giving an excellent finishing touch. If in doubt please feel free to call our Sales Team who will be happy to assist! 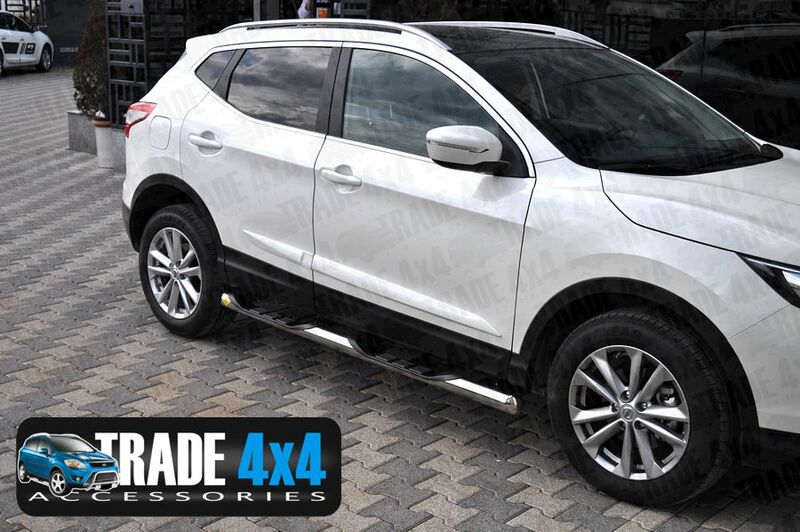 Click the button below to add the Nissan Qashqai 2014 Side Steps Bars VIPER BB005 76mm to your wish list.